Article 5 by Kristen Simmons Review - My Life Is A Fairytale That Will Never End. 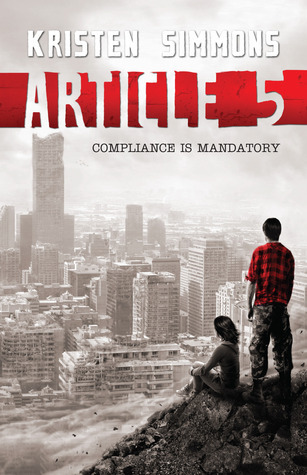 Article 5 is an awesome dystopian book. The society people live in is completely awful and people are literally being killed everyday and noone can do anything about it. The book is filled with action, loss, people struggling to survive and good romance. Ember. Wow, how much this character grew in the span of 350 pages. I was stunned. She grew form a normal teenager with low profile to a warrior girl fighting to save those she loves. And she was completely awesome! Though in the beginning I hoped she would have fought some more for herself, but she totally did it in the end of the book and I was proud! Chase. Geez, this guy was completely unreadable in the beginning. I couldn't figure him out. But not for long. When he opened up a little, he became a gorgeous character. He was amazing and the force and will he had to protect Ember from the whole world, was so beautiful. I hadn't realized how fragile I was until that moment, when all the fear and anxiety slammed into me with the force of a sledgehammer and I cracked. "I got in a fight," he said with a small smile. "With a tree," he added when he saw my distress. My eyes widened. "I guess you lost." "You sh-should have seen the tree." I wondered what he'd done that had been so terrible that he wouldn't accept even an ounce of kindness from another person. It seemed impossible just then that I could ever hate him more than he hated himself.